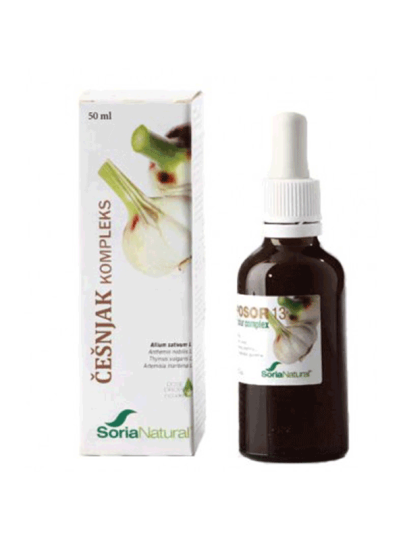 Soria Natural Garlic natural complex of extracts of garlic and herbs chamomile, tarragon and thyme in nonalcoholic solution - a mixture of vegetable glycerin and purified water. Peroral drops do not contain alcohol and are suitable for children, liver and others. It does not contain any colorants, preservatives or any additives. One complex of garlic is sufficient for about two weeks of use. For best results it is recommended to use it for at least two months. Adults: We recommend an effective daily dose of 1 ml (25 drops) three times a day diluted in water. For children up to five years eight drops three times a day. And for children from five to twelve years, half the dose that is advised to adults. Dietary supplement. It is not a substitute for a balanced and varied diet. Do not use in the event of an allergy to the plant. Before using, read the instructions in detail.